This oil painting was made by Samundra Man Singh Shrestha in 2004, and depicts the standing form of Manjushri, the bodhisattva of Wisdom. 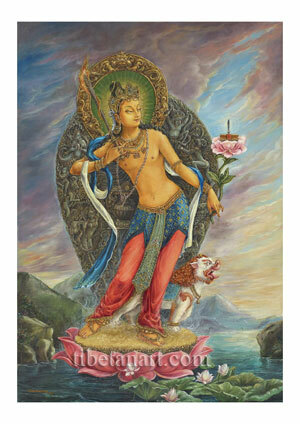 In triple-bend posture Manjushri stands gracefully upon the seed-head of a pink lotus that arises from a lake. Wisps of early morning mist arise from the surface of this lotus-lake against the distant hills, as Manjushri faces towards the dawn sky with its multicoloured clouds. Manjushri is youthful like a twelve-year-old Indian prince, with a radiant golden complexion, a perfect bodily form, and a beautiful face that reflects the majesty of his pristine awareness. A billowing blue and white silk scarf coils around his upper body, and as lower garments he wears a red silk underskirt with an embroidered blue silk upper skirt or loincloth. Hanging from his jeweled belt is an ornate Newar ‘waist ornament’ (jabhin), and around his neck he wears the three gold, silver and pearl necklaces that are characteristic of Newar deities. He also wears golden bracelets, armlets and anklets, jeweled earrings and finger rings, and the five-jeweled crown of a bodhisattva or sambhogakaya deity. Half of his hair is piled up into a jeweled topknot, while the other half curls freely about his shoulders. With his right hand he holds the golden handle of his wisdom-sword that cuts through all delusions and obscurations, its sharp iron blade blazing with a coiling mass of wisdom-fire. With his left hand he holds the stem of an immaculate lotus, the seed-head of which supports his twin attributes of a text on the ‘Perfection of Wisdom’ (Prajnaparamita-sutra) and a small upright sword that radiates light. Light rays emanate from Manjushri’s head against his green inner halo, which is encircled by a golden torana adorned with the traditional Newar ornaments of two ferocious makaras or ‘crocodiles’ with long swirling tails, and the crowning serpent-devouring and ‘glorious head’ (kirtimukha) of Chepu, the ‘half-formed’ elder brother of Garuda. The aura that surrounds Manjushri’s body is embellished with mythical creatures and emblems, which include: a ritual vase; a garuda and gryphon; elephants; a dancing goddess; and a young god that stands on a horned-deer or sharabha as he supports the form of a serpent-crested naga-king. Standing behind Manjushri upon the seed-head of the lotus is his roaring white lion vehicle, which is adorned with a fiery mane, golden ornaments, and a blue silk saddle blanket.